Currumbin Creek starts its journey to the sea through the gorges of Mt Cougal National Park before gathering at the Currumbin Rock Pools, a popular swimming and picnic spot for tourists and locals. 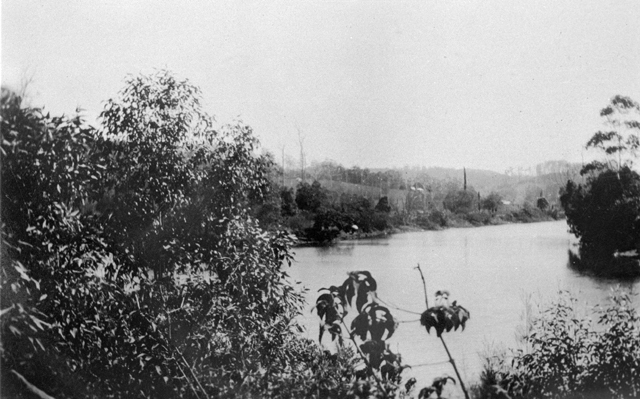 The creek running north of what would become the New South Wales border was surveyed by Robert Dixon in 1839 and was initially named Anson Creek. Conflicting records make it unclear if the name was chosen to honour the former First Lord of the Admiralty Sir John Anson or Sir George Anson a British military officer, politician and private secretary to Prince Albert, Queen Victoria’s husband. The name Currumbin is a Yugambeh language word that has been interpreted in three possible ways; ‘quicksand’, ‘kangaroo’ and the ‘place of tall trees’. Currumbin Creek starts its journey to the sea through the gorges of Mt Cougal National Park before gathering at the Currumbin Rock Pools, a popular swimming and picnic spot for tourists and locals. The 20 kilometre long creek then travels through agricultural and residential land before reaching the Pacific Ocean just north of Currumbin and Elephant Rocks. 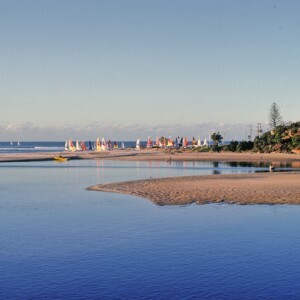 Currumbin Creek has a diverse fauna with a wide variety of freshwater fish and platypus in the upper reaches while the sections nearer the sea have a wide variety of saltwater marine species and is known to have dolphins visit. The area is also an important mangrove habitat with the Beree Badalla Reserve made a conservation area in 1980 with the support of the Friends of Currumbin group. The mangroves and creek in this eastern estuary section was also made a recognised fish habitat in 1983. 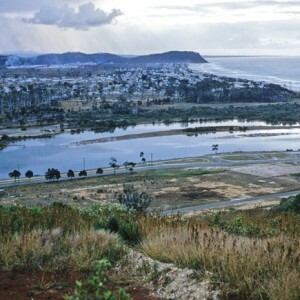 The lower estuary where the freshwater creek meets the sea is impacted by the tide and shifting sands and the mouth of the river has frequently silted up with sand. In the past residents would attempt to clear it away by hand to restore water flow and to improve fishing and minimise flooding. 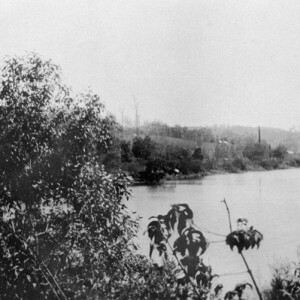 During the first part of the twentieth century a sandy island known as Bill Birch’s Island or Granny Birch’s Island was located in the mouth of the creek. Following her husband Bill’s death, Maria Birch continued to lease the small island living in a house that was partly built of driftwood. 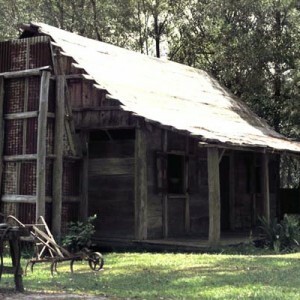 Her nearest neighbours on the island were a Yugambeh family. 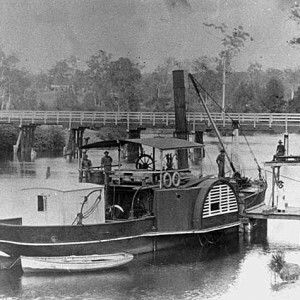 The island remained in place until the 1930s when it was washed away by a cyclone and flood water.In 1903 a railway bridge was built across Currumbin Creek as part of the Nerang-Tweed Heads extension of the South Coast Line. The bridge are still in situ next to the M1 Pacific Highway Motorway and is used as a pedestrian bridge. The first bridge for cars across the creek opened in 1926 at Thrower Drive only to be damaged by flood waters a few years later in 1931. Repairs to the bridge lasted for nearly 50 years until it was replaced by a new concrete bridge in the 1980s. Numerous other road bridges cross the creek all the way up the valley. In the early 1970s, the Gold Coast Highway was extended across the creek bypassing Thrower Drive. 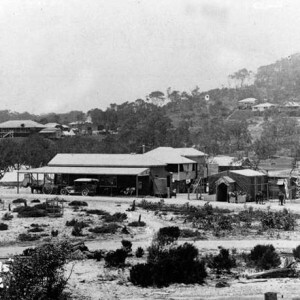 The new Currumbin Creek Bridge was opened by the Queensland Minister for Mines and Main Roads, R. E. Cramm in 1974. In an attempt to stabilise the mouth of the creek a seawall from Currumbin Rock to the mouth of the river was built in 1973 and 1978 with a rock wall also constructed on the northern side of the creek at southern Palm Beach in 1981. 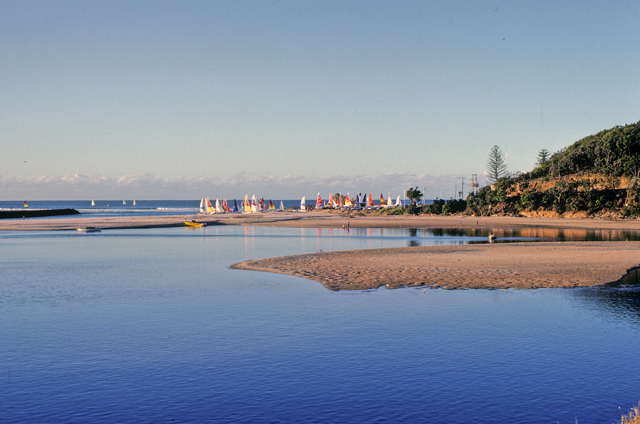 The area in front of the creek mouth, known as Currumbin Alley, is a popular local surf break and is part of the Gold Coast World Surfing Reserve. Longhurst, Robert. 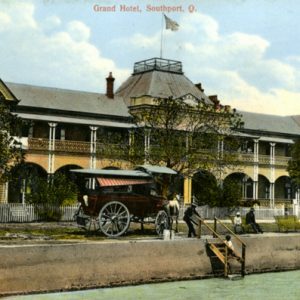 Gold Coast: our heritage in focus. 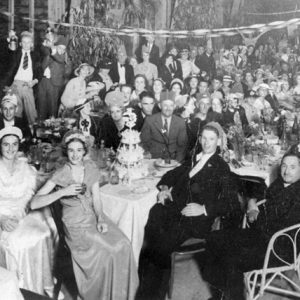 Brisbane: State Library of Queensland, . Longhurst, Robert. From Tallebudgera to the Tweed: an early history of the southern Gold Coast. Surfers Paradise: Gold Coast City Council, 1996. 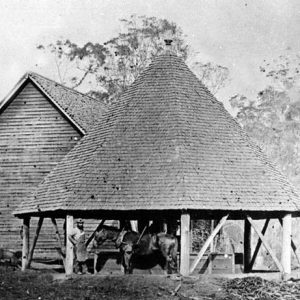 Currumbin Valley State School: history of the school and district 1908-1988. Currumbin: Currumbin Valley State School, 1988. City of Gold Coast Council. http://www.goldcoast.qld.gov.au/environment/currumbin-creek-catchment.html Accessed 7/12/2015. City of Gold Coast Council. http://www.goldcoast.qld.gov.au/thegoldcoast/past-coastal-protection-works–10965.html Accessed 4/1/ 2016. Griffith University. 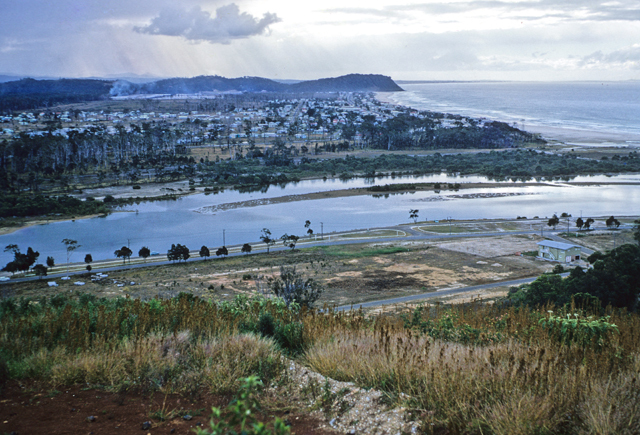 https://www.griffith.edu.au/__data/assets/pdf_file/0003/322851/Currumbin-Creek-Coastal-Processes.pdf Accessed 4/1/2016.